Fonts for commercial use is exactly what a great project needs. Make your texts catchy and let ’em stand out. There are 2 points that are important to the text its main idea and its visual component. The latter is achieved by proper fonts. Here you’ll get a pack of fonts that are specially made to help you style your website’s copy or create amazing design projects. All items from this pack will be a perfect fit for a multitude of projects. No matter what project you’re working on, it definitely requires catchy fonts, and here you can get them at a fair price of $10. For simple texts, headers, logos, banners, different cards this pack will come in handy. The archive contains 29 fonts, grouped in 5 extended font families. Nice, modern, bold, they can turn any type of text into an eye-candy piece of writing. Unlimited personal and commercial use is one more bonus of this pack. Don’t miss a huge discount for this bold collection of fonts. Dress your texts up! Keep calm…and grab these fantastic fonts! They are the easiest way to add a fresh touch and a pinch of originality to your designs in no time. 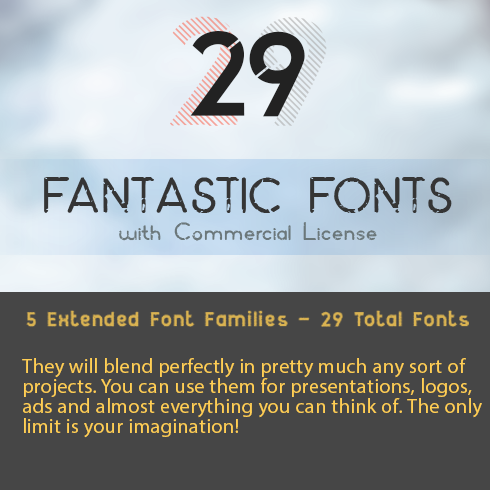 This collection features 29 fonts, all grouped in 5 extended font families! They will blend perfectly in pretty much any sort of projects. You can use them for presentations, logos, ads and almost everything you can think of. The only limit is your imagination! 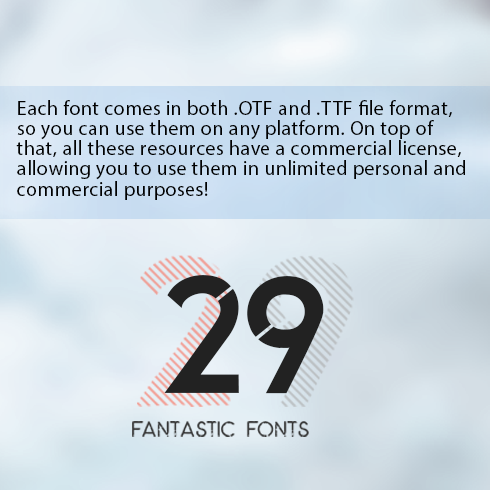 Also, each font comes in both .OTF and .TTF file format, so you can use them on any platform. On top of that, all these resources have a commercial license, allowing you to use them in unlimited personal and commercial purposes! Extended font families are indeed extremely useful, but also expensive. Usually you would have to pay $850 for this awesome collection, but exclusively on MasterBundles you can get it for only $25. How To Define Fonts and What Renders Fonts Essential? Font can be described as a graphic rendering of text. We could also summarise it as a design pattern of a collection of characters. With different styles, point sizes, weight, and coloring, fonts determine the style of complete design. The prices on a single font range between $7 to $100 based on the marketplace and creator. Presently there are essentially 5 types of fonts. Serifs tend to be more classic, you can identify them via tiny lines on the ends of letters. Sans-Serif fonts are modern, and characters will not have small lines . Slab-serif fonts feel blocky and massive, these fonts add substance to the overall design. Script fonts look like hand writing and also have interweaved letters. Stencil fonts are recognized by curved boundaries and narrow strokes, use them to develop a creative statement. How Can Web Fonts Impact Impression of the Product or Company? When talking about making banner ads, one needs to pick a font rather thoroughly. Ad banner designers should pick those kinds of web fonts that will correspond to the feeling of their ad. The web font itself does not simply bring details in a textual form but also fills it on an emotional level, if one is put to use properly. Most of the time, the ad textual content shows the reader an idea of the brand’s product, which means a well-chosen font will only contribute to the desired aesthetic impact. When the web font pattern corresponds to the content and is also paired nicely with the picture, it will result in the prosperity of your commercial plan. For that reason, one should not skimp on getting exclusive and highly aesthetic fonts. What Are Font Packages and What Is Their Price? A font package is simply a set of various (2 to 15) fonts offered at more affordable cost. The best part of purchasing units is that they cost a little more than an individual web font does, as long as they are on discount. The average cost of a font set on our site is just two to twenty dollars. However, be fast: the life cycle of each bundle lasts only 5 days. I Have Not Seen Any Desirable Fonts in This Package. What to Do? Do not worry! MasterBundles offers tons of various bundle choices for different events and designs. Just look through our site and you’ll definitely come across something to your preference and requirements. What Other Sorts of Product Bundles Do You Market on MasterBundles? In addition to the font bundle deals, MasterBundles boasts numerous other spectacular packages. Take a look at web template deals, icons, textures, and patterns, image bundles. There are additionally electronic books and courses, stock images, logo designs, illustrations and add-ons, mockups, and various categories. We have thematic Xmas and Valentine’s day bundle deals, post cards and powerpoint templates. And also, obviously, our favorite under $5 deals! MasterBundles.com is an internet marketplace. On our resource, expert designers market their masterpieces at the best prices. We offer the best design bundles on the market, and our products are highly praised by buyers. Go and visit our blog, it truly is loaded with useful and motivating material for professional designers. Also, in case you sign up for our newsletter, you will be the first to be informed on our discounts. And we love discounts. There’s always coupon codes and promo codes available to cut the price to a minimum.